We had a steamy hot flantastic weekend at the Vintage Vantage T-shirt Shop and Hug Emporium tent at Outside Lands Festival in Golden Gate Park. Guadalajara Joe performed a ninja set, Gaby V rocked and soothed the weary souls, and more free hugs were passed out than wooks. produce to local wines. One stall offered free hugs along with vintage t-shirts. 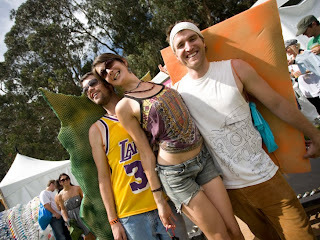 And here's an official OSL photo of a few free huggers spreading the love mustard! Success! Already can't wait for next year.